Posting this up for Basit. 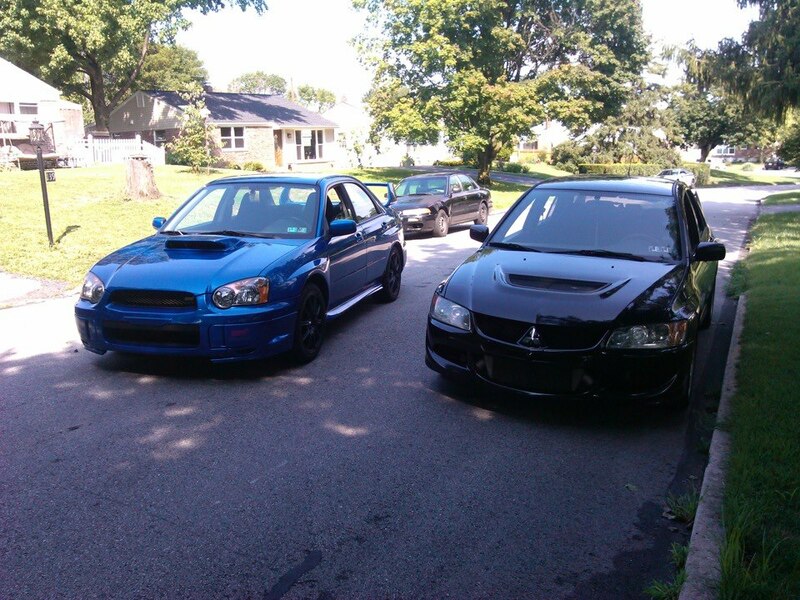 Basit recently bought a new evo bone stock with 115k miles on it. Everything was pretty much stock in the car. 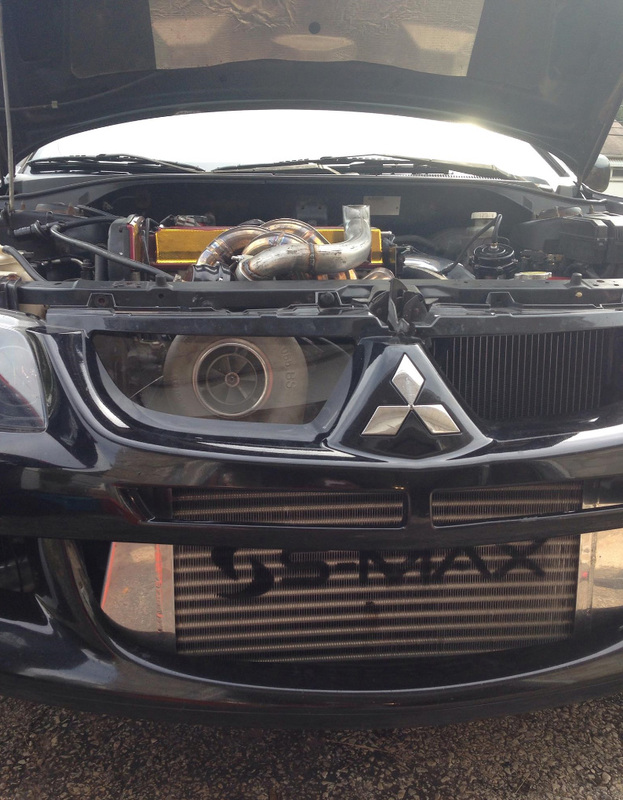 He started swapping parts, and ended up with a bunch of different brands on the car. Im impressed by this car. The fact its on 93 octane and how it made power with off brand parts on it. I would like to thank Steve / 5LEEPER for helping Basit with the logging and setting everything up. that makes it 10x easier for me. If anyone is from the Philly area that is scared to do this kind of tuning and needs help Steve can help no problem. It makes the tune session go much much quicker when a veteran is in control of the laptop / evoscan / logging. Last edited by tscompusa; Nov 7, 2013 at 08:31 PM. This car deff rips! Compared to my 2.4L FP Black it feels super lazy spooling. We are comparing a 2.4L smaller turbo on E85 vs Stock 2.0L on 93 pump so thats expected it just makes you appreciate the 2.4L bec you forget how laggy the 2.0 is. 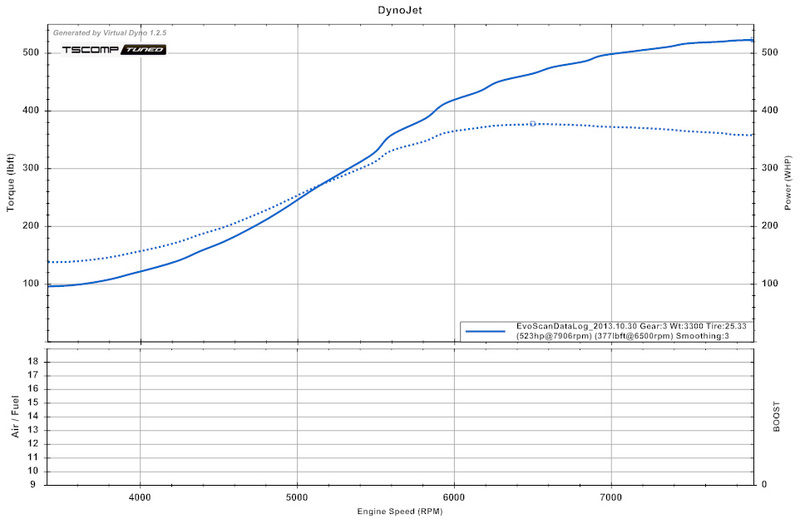 It is for sure making every bit of 520whp feels super fast once it gets going. I think this car with good driving should go 129-130 in the 1/4 miles easy! Nice to see another stock block car rocking 500+whp! Although that thing seems like a lag monster, I guess it only helps keep his motor together haha. I would love to see what the set up does at the track. On a side note, where did you get the plexiglass shield for the bumper? With his tq it should last awhile! I think the motor has 114k on it so it will be interesting to see how long it holds up. The plexiglass he made it i believe from home depot. damn this turbo is very good! do you have a boost log just for reference? seems to be not to laggy. It is a very big turbo! 66mm inducer & 91mm exducer rated at 82lb/min. Last edited by el.guerrero; Oct 31, 2013 at 02:52 AM. 82lb min is exactly what the 6466 is rated to. This turbo does spool up very nice for its size just like the 6466! this is a good comparison with 6466. Also they have the same cams. this bw s366 is very cheap and good! waiting for tom to know if it has a boost plot. awesome ! i was looking to switch this turbo and FF setup as an "upgrade" from my 35r. i think this turbo really needs more boost to wake the car up and can be fully taken advantage of on a built motor with a 2.2/2.4. it would probably just be a lateral movement for me. Could you please overlay this with the 2.0 6466 on pump you recently did. So..., the S366 is comparable to the 6466, right? tom please overlay it with the 6466.. Thank you tom car rips but I wish I had a 2.4 . Still re learning how to shift car has act clutch so I'm trying to manage 4th gear lockout. Hopefully hitting track this weekend. Posting up more pics soon.